As the manufacturers of supercars continue to explore ways to satisfy shareholder expectations, phrases like “race derived technology” have started to drift into nebulous marketing territory, where they pertain more to concepts and emotions than the mechanicals found underneath the skin of a vehicle. McLaren is, first and foremost, a company that builds race cars. They are not part of a larger company that cranks out road-going vehicles by the thousands, so there isn’t a wealth of parts bin components from more common models to pilfer from in order to reduce development and build costs. So when we were handed the keys to this Volcano Yellow 650S Spider, we had a hunch it might be something genuinely special. A car that felt bespoke, made by a company whose primary objective has always been about building vehicles made to perform. Something truly compelling. The first time the all-aluminum 3.8-liter V8’s turbochargers spooled up, our suspicions were confirmed. What is the idea behind the 650S Spider? 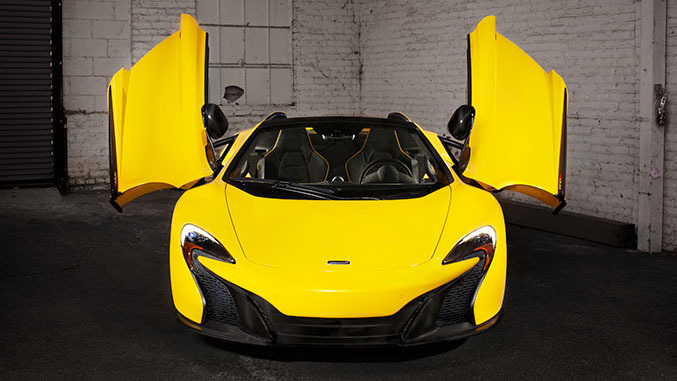 It might be easy to dismiss the 650S simply as an MP4-12C that wears the face of a P1. While the 650S shares its chassis and power plant with the outgoing car, there’s a lot more going on here than a mere refresh. In truth, more than twenty five percent of the 650S is all-new, and the lion’s share of tweaks come directly from lessons learned developing not only the 12C, but the million-dollar P1 hypercar as well. As McLaren’s volume seller, the 650S needed to be on point. Accordingly, they’ve given it more power, sharper handling, and a higher sense of dramatic flair than the car it replaces. Perhaps even more importantly, the rough edges from its racing heritage have been honed without dilution, yielding a car that’s more forgiving around town and yet still thoroughly engaging when you turn up the wick. Power comes from a revised version of the dry-sump M838T 3.8-litre twin turbocharged V8 from the 12C, which now develops 641 horsepower and 500 lb-ft of torque thanks to beefed up pistons, valves, exhaust components and other sundry bits, up 25 hp and 57 lb-ft. It’s hooked to the same seven-speed Seamless Shift Gearbox from the outgoing model, but with some substantial software revision that makes the transmission a more docile creature in traffic and yet also more responsive during high performance maneuvers as well. Acceleration in the 650S is flat-out breathtaking. Using launch control, the 3200 pound 650S Spider gets from zero to sixty in an honest, repeatable 2.9 seconds on its way to a 10.5 second quarter mile time and a 207 mile per hour top speed. Boost comes on with serious authority at around 3400rpm, and when it does, the world around you simply becomes a blur as the revs rapidly build to the 8500rpm redline. The recalibrated dual clutch transmission allows near-instantaneous gear changes via the paddles with a willingness to take commands that makes the whole process feel rewarding to use whenever possible. Left to make its own decisions, the gearbox logic as determined by the drive mode you’re in (Normal, Sport, or Track) has been refined significantly from the 12C, and while we still prefer to call the shots when the road gets twisty, the SSG can also be trusted to get the job done on its own with total competence. More crucially, after spending over an hour in LA traffic, we can report that the transmission can cope with the grueling nature of stop and go driving with a surprising amount of civility. Perhaps not the most pragmatic choice for a daily driver, it certainly could be done without wanting to pull your hair out, and that’s no small victory for the 650S. How does the 650S Spider handle? With a revamped stability control system, spring rates that have increased by 22 percent in the front and 37 percent in the rear, and retuned damping, substantial effort has been made to improve feedback and dynamics while also keeping things livable on the imperfect roads one encounters outside of the race track. 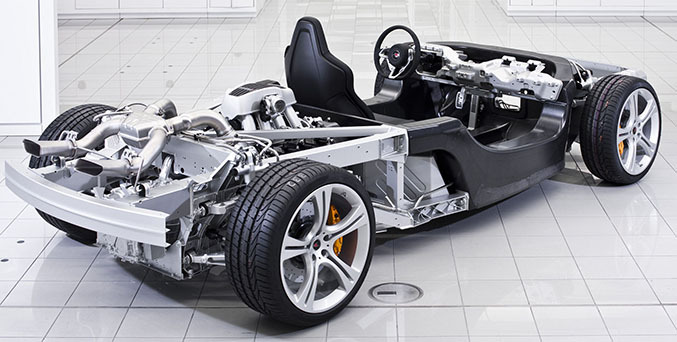 Like the 12C, rather than using a traditional anti-roll bars, the 650S uses a unique hydraulic system called Proactive Chassis Control to adjust individual damper stiffness based on the driving mode and real-time data about driving inputs. The end result is a similar effect to adaptive damping, allowing the car to be compliant one moment and unyieldingly flat the next by the flip of a switch. Coupled with the now standard carbon ceramic brakes and fantastic electro-hydraulic steering, which allows for steering effort to increase as the wheel is turned off-center, along with the rigidity of the carbon fiber MonoCell tub, the 650S is an absolute joy to carve corners with. Braking is consistent and linear with a firm pedal feel and massive stopping power is always on tap, not only from the huge discs, but also from the rear spoiler which shifts upright to serve as a supplemental air brake when slowing things down from high speeds. Unlike many cars equipped with carbon ceramic brakes, the 650S does not feel overly anxious to bite at the top of the pedal, continuing the theme of everyday livability, though they do suffer from a perceptible amount of noisiness that’s common with ceramic discs. How are the design, materials and fit when you see the car in person? A common complaint with the MP4-12C was its somewhat anonymous styling. To address those concerns, the 650S borrows some of its new visual identity from the P1 hypercar, most obviously seen in its new front splitter and LED headlamps. Not only do the revisions give the car more curb appeal, they help give the brand as a whole a unique, cohesive visual identity, and with the 650S currently being the central model for McLaren Automotive, this is also no trivial thing. It’s still not as instantly recognizable as a Lamborghini Huracán or a Ferrari 458, but McLaren now has a design language to build upon that is wholly their own, and its comparative subtlety will undoubtedly better suit some potential buyers. That’s not to say that the 650S lacks drama. The sport exhaust of our tester was happy to bark out the announcement of our arrival at each stoplight, and the new car’s bodywork, especially in this particular coat of paint, was never lacking for a pair of eyeballs to ogle it. The process of dropping the top takes 17 seconds from start to finish, requiring nothing from the driver other than the press of a button and a road speed of under 19 miles per hour. And quite frankly, unless it’s raining, you really have no excuse to leave the top up, as the rear window acts as a wind defector and keeps buffeting to a minimum. Torsional rigidity for the 650S Spider is also identical to that of the 650S coupe, and attacking your favorite piece of tarmac with the sky as your roof and the sounds and sensations of the world around you as part of the experience is well worth the price of admission over the standard car. McLaren seems to agree, as the coupe accounts for such a small fraction of 650S sales that it’s actually considered a special order model. While the interior of the 650S isn’t exactly a revolution from the 12C, it’s now available with far more customer personalization options through McLaren’s new customization programs. It maintains the 12C’s basic layout – a vertically oriented infotainment system, driving controls situated below, HVAC switchgear on each occupant’s armrest, and a gauge cluster dominated by a large tachometer in middle. Our tester was dressed almost head to toe in Alcantara, and most of the parts not draped in the faux-suede were done up with carbon fiber. While most of it is a carryover from the 12C, this is one case where raiding the parts bin doesn’t really cheapen the car, as using components from an outgoing supercar is far less egregious than, for instance, discovering that the same air conditioning vents in your first-generation Ford GT would also be found in an F150 pickup. On the whole, the 650S retains everything that worked about the MP4-12C, improves upon much of it, and addresses just about all of the gripes made about the outgoing car. Not only is it a better performer, it’s also a more compliant every day driving companion – a rare combination of improvements to get right simultaneously. 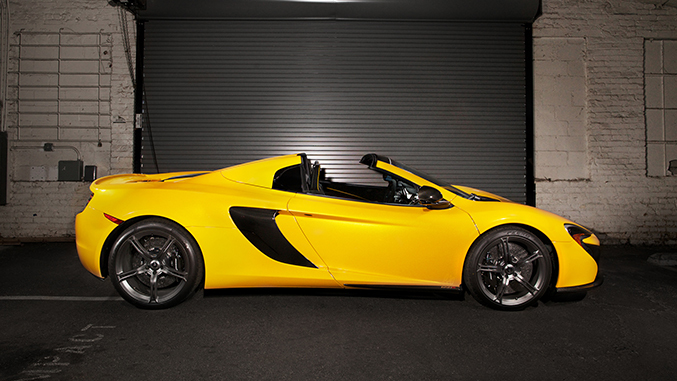 And while the MP4-12C could turn heads, the 650S Spider will keep them turned, especially when the roof is down. It sports a performance envelope that’s far beyond the capabilities of most drivers, but it doesn’t punish the driver with boredom or harshness if they happen to be outside the confines of an F1 circuit. It is, in short, the fantasy of open-top supercar motoring fully realized.